France, 2009, 110 minutes, Colour. 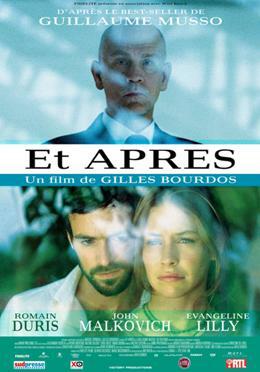 Romain Duris, John Malkovich, Evaneline Lilly. From France, a film about death and the afterlife, then from the US Clint Eastwood’s Hereafter. The two films could serve as companion pieces. Afterwards opens with a death and a resuscitation, a little boy who is hit by a car trying to get help for a little girl who has had an accident. He seems dead, but comes out of coma to grow up into a father but also a rather ruthless insurance manager. The question of why he is alive is raised in black and white flashbacks: a doctor who asks the boy why he -came back from the coma. Romain Duris plays Nathan, the man who came back. When a visitor to his office, Dr Kay, wants to talk to him about his health and caring for himself, he is disturbed. This is exacerbated when the doctor tells him that a man on the subway (the setting is New York) is going to die within minutes. And he does. Dr Kay sees an aura around those who are destined soon to die. It emerges that Dr Kay really is an authentic doctor and does care for people, especially those who are dying. He comforts their families. Once again, he gives Nathan an indication that someone else is going to die. Nathan mostly believes him and follows through with the doctor’s suggestion. But, the experience so disturbs him that he assumes the doctor is warning him about his imminent death. He decides that he must alter his life and mend the breaks, especially with his estranged wife (who was the little girl at the opening of the film) and daughter. Some moving flashbacks explain why this has happened. There are many contemplative moments in the film, the languid opening on a lake, fields of puffballs, the desert and a beautiful flower that dies the day it opens. The film is not exactly about the hereafter. Rather, it presumes the hereafter but wants to emphasise that the important place for healing and forgiveness is here, before death. Romain Duris is a versatile French actor, very popular in France and in Europe. Dr Kay is played by John Malkovich in a performance that is quite restrained compared with many of his other, rather eccentric, performances and is the more affecting for it. While the questions of afterlife, of afterwards, are important, Nathan discovers that it is in life that the important choices are made, actions done. He also discovers why he really came back from his coma. 1. The title, the French title? Expectations? 2. Themes of life and death, living life to the full, preparing for death, the afterlife? The human aspects, intimations of immortality, religious dimensions? 3. The lyrical beauty of so much of the film? The long shots, the long takes, the woods, the lake, the puffballs, the fields? The gardens, the desert, the desert flowers – and death? 4. The contrast with New York City, the cityscapes, the buildings, offices, streets? 5. The contrast with the poorer areas, hospitals, the centres? 6. The prologue with Nathan and Claire, the tracking through the lake, the accident, Nathan and his being hit by the car, his death, the light, his returning? Kay and the questions? The black and white photography of the flashback? Nathan in a coma, not knowing the purpose for his return? 7. Nathan as an adult, in the office, with the other businessmen, the insurance business? The issue of the Haitians? Decisions about money, recompense? The later visit of the Haitian group, Nathan and his hard line? The secretary, concern about his life? 8. Doctor Kay, his discussions about Nathan’s health, the diagnosis, the check-up, the food? The importance of his seeing the halo and the aura around people? The situation of the subway, Kay, Nathan, his negative reaction? His anger, trying to get out of the subway, the closed gate, his return? The man whom Kay said would kill himself? On the platform, his death? The shattering effect for Nathan? 9. John Malkovich as Kay, a restrained performance, quiet and intense, his mission? His work in life, with the dying, with the bereaved? His role as somebody who warns people, seeing the aura? His advising Nathan to check on Anna? 10. Anna, her past experience, coming to the United States, her being used by the students, Nathan and his concern? Her memories? Her disappearance, reappearance at the diner? Nathan going, talking, wary, concerned about her death, giving his card? Her financial situation, his giving the money? The party for the birth, the father dealing with the electricity, getting the shock? The fact that he had come to visit his daughter, the reconciliation before his death? Nathan offering the money, the robbery, the shooting, Anna’s death? Nathan thinking he had saved Anna? His blaming himself for her death? Confronting Kay? 11. Nathan’s memories, with Claire, the marriage, happy, the daughter, the baby son, in the field with the puffballs? In bed, Paul in his cot, the cot death? The daughter and her grief? The helper, his talking, Nathan withdrawing, walking and weeping? His anger towards the carer? The separation from Claire, the phone calls? 12. At the office, his decision to leave? The visiting of Doctor Kay’s centre, seeing the people comforting those who were dying? The angry young man, his story, his desperation, the media, the response of sympathisers, his angers – and later his death and Nathan going to the hospital? His decision to go to Arizona, flying with Kay? Kay seeing the aura on the couple in the car? The later accident, the crosses by the wayside, his daughter asking him about them? At home, talking with Claire, Claire’s life, going to take the photos in the desert, the flowers and their blooming and dying on the same day? Nathan following her, expressing his sorrow? 13. Nathan’s realisation that Claire was to die, confronting Kay, Kay not having said Nathan would die but preparing him to face reality? 14. Claire’s death? Talking with Kay, his reason for returning from the dead? The realisation of his mission? His seeing the aura? Being a messenger to comfort and to help people cope with death? 15. The film as a meditation, exploring the meanings of life and death?